When Nursultan Tauman went out for a stroll along the banks of the Ural River, he could not believe what he saw. “Dead fish, floating on the dirty river,” recalled Tauman, a native of the western Kazakhstan city of Atyrau, where the 2,500-kilometer Ural enters the Caspian Sea. Since December, more than 120 tons of lifeless fish have washed ashore on the banks of the Atyrau delta. The massive die-off has stunned ecologists and sparked a debate about what might be the root cause. One prime suspect is the intense industrial activity upstream from Atyrau, which is just as famous for its oil as its fish. “With all the factories [and] oil drillings that happen nearby, the fish, including the famous red fish, are dying without cause,” Tauman said. Tauman also suspects that the leeching of nearby oil refinery chemicals might have had something to do with the deaths. “I saw the dirt of the river. It looked like chemicals, nothing like that has ever happened before,” he said. The smell of the dead fish was one thing. But seeing the treasures of the Caspian region floating lifelessly left Tauman heartbroken. While the Atyrau region has long sustained Kazakhstan economically with its wealth of natural resources, worries about the environmental damage being unleashed on the river have been largely overlooked by the central government. There are 19 commercial fisheries in Atyrau and 9,435 tons of fish was caught last year alone. 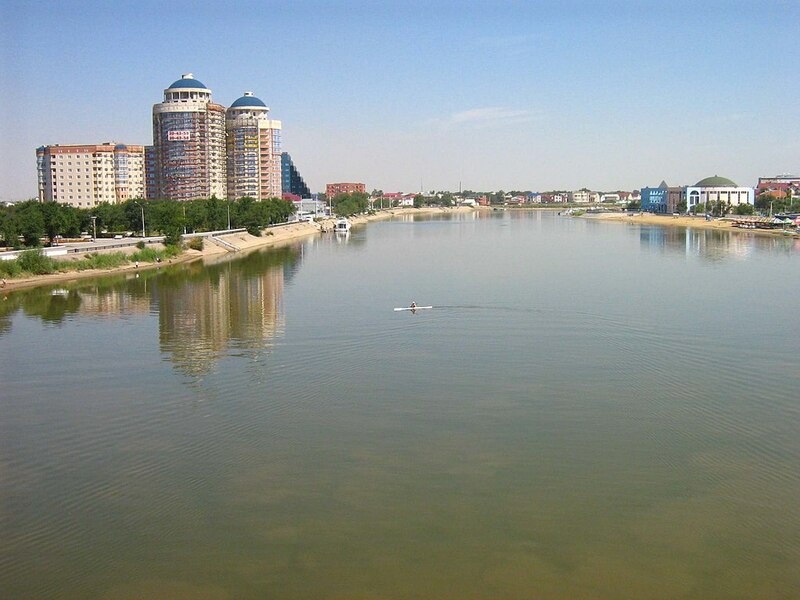 In February, prominent ecologist Muftah Diarov told Atyrau-based newspaper Ak Zhaiyk that the waste of factories along the river and the sewage of administrative buildings are contributing to a buildup of sedimentary groundwater. This buildup absorbs water moisture, prompting the bottom of the river to grow taller and the water to grow murkier. That is why it is necessary to routinely work on deepening the bottom of the Ural river, experts say. But according to another ecologist, Galina Artyukhina, such projects have not been carried out properly. “Perhaps the dead fish will finally bring attention to the conservation of the Ural,” Artyukhina said. When it comes to this latest die-off, there is some disagreement about the exact cause. Diarov believes that the waste chemicals of Atyrau Oil Refinery, built in 1991 around 2.5 kilometers from the riverbank, contributed to the deaths of the fish. Artyukhina is wary about jumping to conclusions just yet, however. “The fish may have frozen in the river over winter,” Artyukhina said. That is a common occurrence in the Ural and other rivers across the world. A harsh winter and heavy snow over ice can kill the fish and other aquatic creatures. It is only when spring comes and the ice thaws that the dead fish start to be noticed by people. Artyukhina suspects that because the die-off happened close to the city center, people noticed more than they did in the past, when dead fish turned up in less populated areas. “This is a manmade disaster,” he said. Khairullin is one of most prominent Atyrau residents engaged in trying to bring awareness to the fish catastrophe. “The ice was not that thick, there was no snow on top of it,” he said. Since December, Khairullin has regularly updated his followers on social media with videos of dead fish, both on top of the river and the bottom. Khairullin and other volunteers regularly clean up the shore, collecting buckets of either dead or dying fish. Khairullin’s outcry for greater awareness has succeeding in reaching the ears of officials. On January 31, the Energy Ministry formed a committee to investigate. But Khairullin is not satisfied with the speed of the investigation. “It has been four months since the water was initially tested,” Khairullin said. Khairullin is not confident that a government-led commission will produce transparent results and he wants instead for an international environmental organization to lead its own investigations. Whatever any inquiry reveals, the damage that has been done cannot be reversed in the foreseeable future. Khairullin is aware that commercial fisheries are divided on this issue. On the one hand, they are losing money, but on the other hand, complaining about it might hurt whatever business they have left. If fisheries complain about low fish stocks, it could crimp their ability to secure export deals, Khairullin said. “They say all is well. But all is not well,” he said. Recently, Khairullin went on a fishing trip with local fishermen and saw for himself how they netted no more than 10 kilograms of fish. “The remaining fish were either dead or half-dead, in comatose conditions. You can’t sell that kind of fish,” Khairullin said. Aliya Uteuova is an Astana-based journalist. Sign up for Eurasianet's free weekly newsletter.